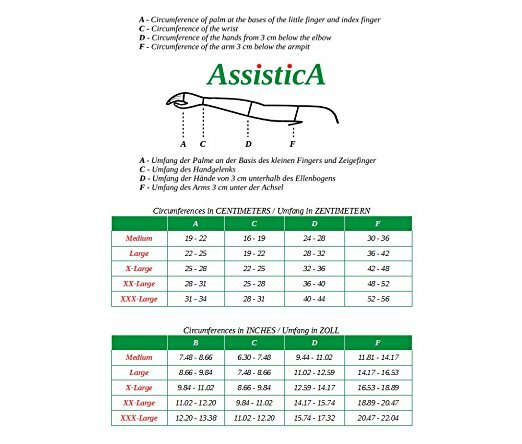 BRAND: Assistica®. 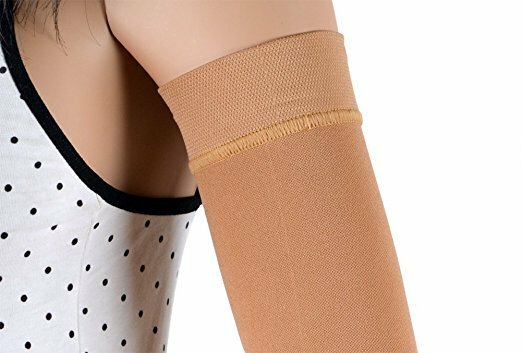 STYLE: Arm Sleeve (fits both the right AND left arm), Anti Swelling Support. COLOUR: Beige. GENDER: Women. QUANTITY: 1 Piece. MATERIAL: Latex Free: 80% Polyamide, 20% Lycra. PURPOSE: The sleeve Assistica® is designed for the prevention and treatment of lymphedema of the upper limbs. The sleeve restores the flow of lymph from the tissues to the hands, quickly and effectively reducing swelling, allowing short term relief. MEDICAL INDICATIONS: After a Mastectomy; After Radiation Therapy; The prevention and treatment of lymphatic drainage in the early and late periods after the removal of the breast; During rehabilitation after operations on the female breast. HOW IT WORKS: Thanks to a seamless circular knitting technology, Assistica® sleeves create the necessary pressure, with increased strength and durability. The sleeve must be worn in the morning until swelling and worn throughout the day. 100% SAFE PRODUCT: We understand this is a major concern when purchasing medical products online. All Assistica® products have passed the necessary medical examinations and laboratory tests. Produced in EUROPE, eco-friendly and certified materials are used.